My students have been taking online NWEA MAP test the last couple of years. I have growing concerns as we move the states tests from pencil and paper to an online format. How will our students adapt? Will the scores match old scores? Teachers have taught student test taking strategies that just don’t seem to translate to the online format. Is this possible for an online test? Sure if students have paper, pencil and space to write. One of these elements is often missing when most classes test online. Next is reading on a computer screen. Whether it is a tablet on a traditional computer screen, reading online is so different from reading off of paper. Can students underline, highlight, write notes next to paragraphs? These are all practices currently fostered in most classrooms. We have the technology to enable these practices for online testing but are we using them? Finally, the age old practice of eliminating the wrong answers. I remember being in 2nd grade and Mrs Garrison at Monroe Elementary teaching us how to eliminate the wrong answers. Cross them out so we don’t accidentally pick the wrong answer. In my classroom, when I collect the test papers I love looking at student evidence of thinking. The pages are marked up, with crossed out choices and helping words. 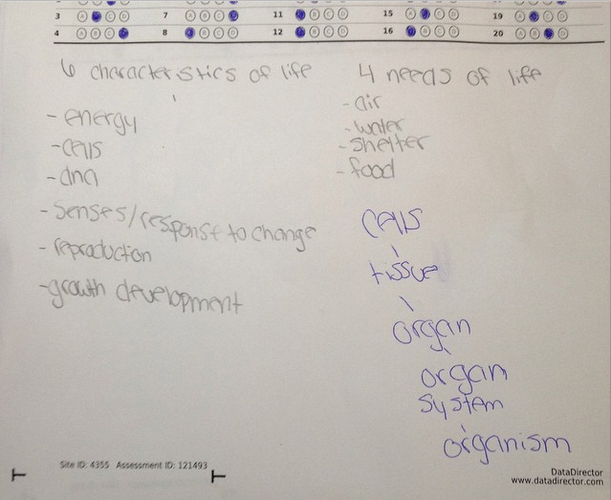 I encourage my students to write out their work on the TEST page before filling out the “bubble” sheet. On last week’s test I had two students come show me their tests to give evidence that they made a transference error not an error in thinking. Having the correct answer on their test paper but wrong on “bubble’ sheet helped me know what skills were missing. How would this work for an online test? Where can they write notes? make cross outs? Online tests need to allow students to use the same skills they have learned for pen and paper assessments, until they do they lake overall validity are are just a novelty! Student will click away instead of taking time to work through the answers. Next Post Why educators (& Parents) need to VOTE!